Being a member of the OSA gives you access to many exclusive perks; from regular updates on our wide range of courses, programs and events, to special discounts and opportunities. By becoming a member of the OSA you are also investing in your school and community – $5 from each membership goes towards our Outreach Program (Downtown Campus) or our ARTicipate Endowment Fund (Orleans Campus), and the balance goes directly into the general operations of this important not-for-profit charitable organization. 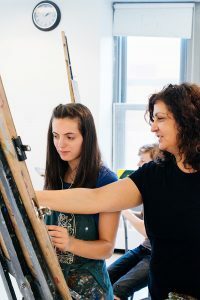 Take advantage of over 137 years of teaching excellence and dedication to arts and culture in our nation’s capital, and become a part of the OSA today. Are you a graduate of the OSA Fine Arts Diploma, Portfolio Certificate or Arts Fundamentals Certificate Programs? Membership is a great way to re-engage with the School and to forge new relationships in Ottawa’s arts community. We would love to welcome you back! • The remaining balance goes directly into the general operations of this important not-for-profit charitable organization. All memberships support the OSA and are valid for one year from date of membership. All memberships cover all individuals in a household. Note: The Student Membership applies to individuals and all family members living within the same household. • Access to rent equipment and studio space at both campuses. *Enrollment in classes and workshops is available to active members only. **Limit of one vote per household. ***An active membership card is required at time of purchase. Discounts will not be applied retroactively, and cannot be combined with any other sale, promotion, discount, coupon and/or offer. Not applicable online. *Limit of one vote to a senior representative of the organization (must be identified at time of enrollment). General Memberships may only be purchased in person at reception! IF YOU ARE ARE ALSO REGISTERING FOR A CLASS PLEASE CONTINUE TO THE REGISTRATION PAGE. **Some restrictions may apply. Contact Malika Welsh, OSA Fundraising Coordinator at 613.241.7471 ext 31 to discuss options and availability. Benefits may change from time to time at the discretion of the OSA.